I no longer carve pumpkins at Halloween. For some reason, our house gets very little traffic on that night and besides, my kids are grown and gone. It's a messy endeavor and for someone as klutzy as I am, also a little dangerous. But October is still pumpkin month--or "eating pumpkin" month. Usually I wait until Thanksgiving to make the pumpkin pie from scratch. Homemade pastry is a little labor intensive. 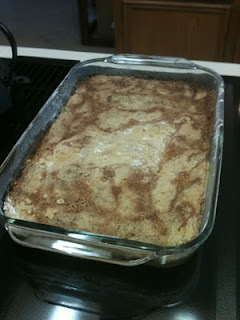 But since I signed up for allrecipes.com I keep getting all these tantalizing pictures of pumpkin pies, pumpkin breads and one I just made, a pumpkin dump cake. If you don't know about dump cake, you are missing something. Pineapple, cherry pie filling, cake mix and butter. Couldn't be easier. But there's a pumpkin version, too. So I made that today. It's a little more difficult than simple dump cake. You have to make a pie filling, but then you pour it into a 13x9 pan, sprinkle cake mix on top--yellow or spice--and cover with melted butter and nuts. I skip the nuts--allergic. I also use an egg substitute like I do in my pumpkin pie--you guessed, allergic. But this comes out very pretty and smells so good. No pastry making involved! Do you have a favorite pumpkin recipe? Please share! One of the greatest things about fall is pumpkins...I love all things pumpkin (no nuts for me either Leann). Cake, rolls, muffins, donut, coffee, pie...yum, yum! Plus, they are so bright and orange, and make people happy! I'm probably one of the few who does not like pumpkin at all. Leann--at bhg.com they have some awesome ideas for decorating pumpkins using stencils and non-toxic paint instead of carving them. Gorgeous! I've got a great recipe for pumpkin soup (not sweet, a bit spicy) that I put together. Everybody that's tasted it has just raved, so I guess that's a good thing. As for pie, I actually like butternut squash pie better than pumpkin. Not quite as strong. We'll have to see how the pumpkin poll goes. I think it's one of those love it or hate things. Like Brussel sprouts. Lorraine loves them, I hate them. Pumpkin: I love pumpkin pie, Lorraine hates pumpkin pie. What's great about pumpkin is that it is an excellent egg replacer for baking. Without the spices, it has little taste. I use about a tablespoon per egg called for in a recipe. Makes for great bar cookies. I need to do some serious research. I LOVE pumpkin pie and pumpkin rolls, but I've been gluten free since July. Gotta look up some GF pumpkin recipes--I know they're out there! Dru, my daughter and I are the only pumpkin lovers in our house! You're not alone. I love pumpkin season! The diners in my area must love it too 'cause since September they've all been promoting Pumpkin Pancakes - yum and I don't have to figure out the recipe. OMG, I love pumpkin pancakes! I remember when my cousin gave me her dump cake recipe years ago, I thought she was magic! I know! How could something that easy be so good? I love the Pumpkin Apple Streusel Muffins form verybestbaking.com, but I usually reduce the sugar. I will have to try the dump cake, I usually make Blueberry dump cake in the summer, have blueberries in the garden. Sure miss fresh fruit season. The pumpkin dump cake looks yummy. I like pumpkin bread and pumpkin pie. Pumpkin apple streusel muffins sound good too. We have one pumpkin in the house so far. The past few years I have not carved any pumpkins for Halloween, but I might just get to it this year. Another pumpkin lover here, & that dump cake sounds really good and easy! Both to rave reviews by friends and family. Thanks all you ladies whose names start with L! I'm heading for that trifle recipe right now. Then I will have to adapt it probably. I should I write a cookbook one day. My (grown now) kids are allergic to milk, I'm allergic to eggs and a million other things. Meals were always an experiment about what I can substitute that will not taste awful. I do make a good dairy free lasagna. Yes, it is possible. I enjoy a chunkier version of pumpkin pie that is not so sweet. I also really like spicy pumpkin soup and tempura pumpkin. I guess I am more of a savory pumpkin lover. Pumpkin tempura? That sounds interesting. The next time I make this pumpkin dump cake I am cutting down on the sugar. It is a little too sweet but that easily fixed! I don't like pumpkin pie, I adore pumpkin pie ice cream though!I've had fantastic pumpkin soup (sweet) and muffins. I love eating pumpkin seeds, too. I may try this pumpkin dump. That dump cake looks yummy. We will definitely have to give it a try. I love allrecipes.com! I've recently seen mention of pumpkin waffles, although I've not come across them in person. I think they sound delicious though. On Saturday I made Cleo Coyle's wonderful Chocolate Fudge Pumpkin Cookies with Pumpkin Glaze that I found at the Mystery Lover's Kitchen blog. They are fabulous (so easy and no eggs or nuts). Also, I don't carve the pumpkins--I use a black marker and draw a face on it. I sit it on the front porch for a while and after a while I bring it in and make it into a pie or soup. 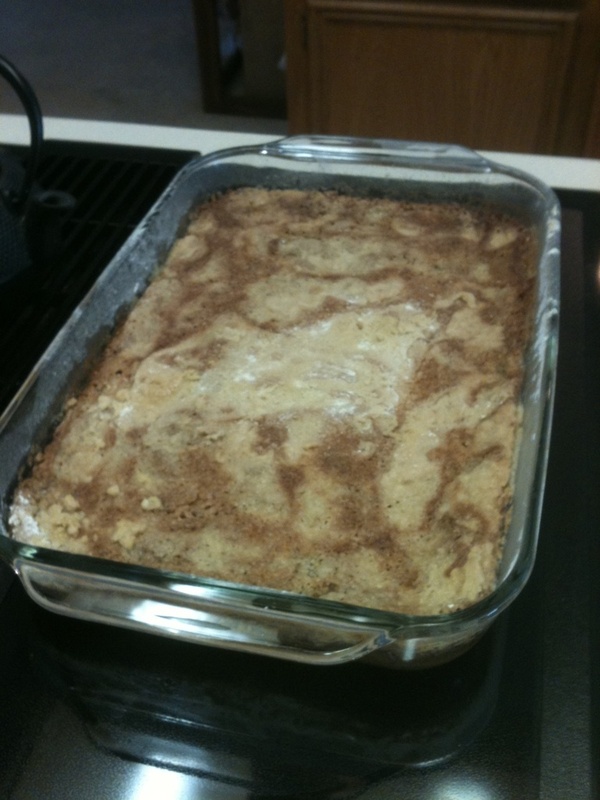 That pumpkin dump cake recipe sounds yummy, Leann I'll have to try it.